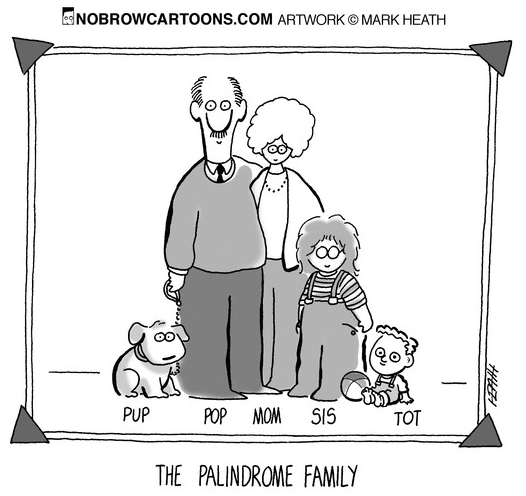 A palindrome is when something reads the same backward as it does forward, like the family pictured above. 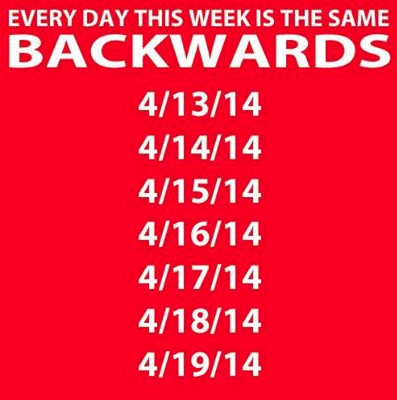 Well, I just discovered that this week has been dubbed Palindrome Week because the date of every day this week reads the same either way. Desserts, I stressed! – Plan an evening where you go out for dessert. Maybe even try a couple of places ordering one dessert from each place. Racecar – Go go-kart riding. Kayak – Rent a kayak for two. A man, a plan, a canal: Panama – Plan a date at home using Panama as your theme. Panamanian Recipes. Movies about Panama. Documentary. Civic – Explore your city as if you were a tourist. Get a map, your camera and have fun. Dates are meant to help you have fun together like you did when you were dating. This one is sure to help you forget your responsibilities and remember why you fell in love in the first place. This entry was posted in Creative Dates, Date Night Ideas and tagged Palindrome Date Ideas, Palindrome Week, Panama Canal Date Idea, Panamanian Food. Bookmark the permalink.